Caitlin Hope and Total Touch jump double clear to be the highest placing amateur in the Welcome Stake. Wayne, IL – June 16, 2016 – Amateur rider Caitlin Hope placed third in the $20,000 Open Welcome Stake, sponsored by C&E Transport, at the Showplace Productions Spring Spectacular II Hose Show. Hope manages to stay in the top ribbons in the grand prix ring while juggling a new career, thanks to Diane Carney/Telluride Farm’s fine tuned program. Hope already has wins under her belt for the 2016 season with her two mounts, Total Touch and Vision EH, including a third place finish in the Amateur Owner Jumpers at the historic Devon Horse Show in May. Hope won the $25,000 David Q Wright Memorial Grand Prix in St. Louis on Vision EH and took second in the same prix on her Total Touch in December. Returning to St. Louis in January, Hope again took top spots, placing second and third in the Lake St. Louis Grand Prix on Total Touch and Vision EH respectively. She went on to the Omaha International, where she took fourth in the $15,000 High Junior Amateur 1.40m Classic on Total Touch. 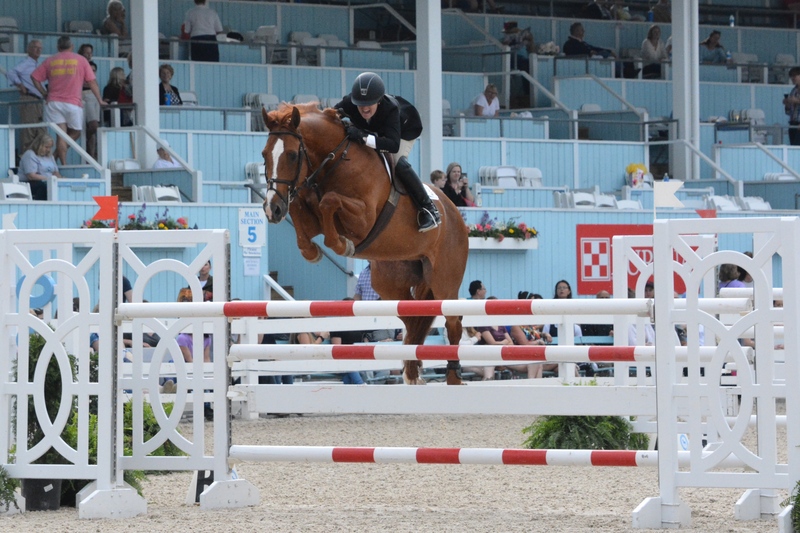 Caitlin Hope and Total Touch in the Junior Amateur Jumpers at the Devon Horse Show. Photo Chicago Equestrian. Hope, 24, lives in Cleveland, Ohio, since graduating from Lafayette College with a degree in Education, and now teaches kindergarten for Teach for America. As a junior rider, Hope had multiple rides in the junior hunters, jumpers and equitation and took regular lessons with Carney on each horse. She earned a USET Gold Medal, was champion in the junior hunters at the Washington International Horse Show and the Pennsylvania National Horse Show and won jumper classes at Spruce Meadows during her junior career. Hope explained that all that experience, is what she falls back on today. The horses stay with Carney in Antioch, Illinois, where the program is strategically planned so the horses peak at exactly the right time for Hope. Carney chooses the riders and the exercises that keep Hope’s horses ready to win. Hope works out at Pure Barre to stay fit to ride. The workout emphasizes core strength and balance, which helps her when she gets back in the tack. She doesn’t ride while she’s in Cleveland but will be riding more now that classes are out for the summer. 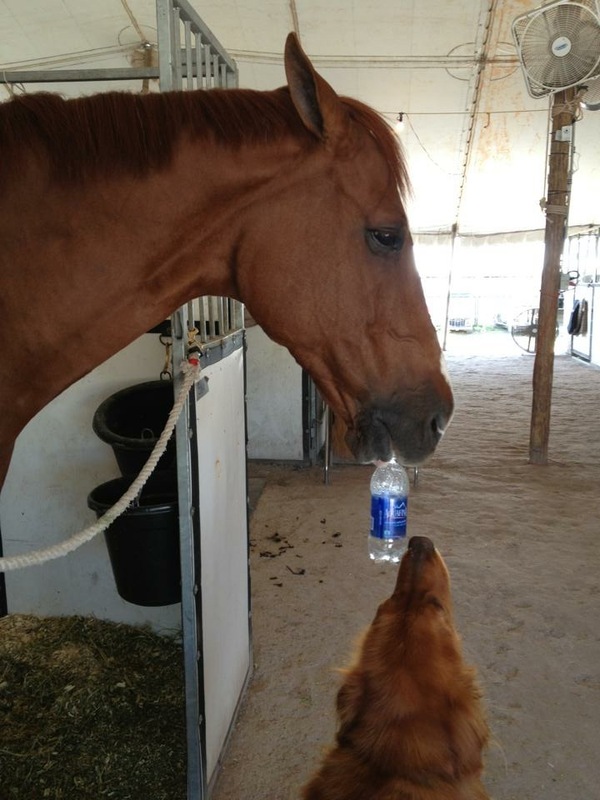 Her horse, Total Touch, is 16-years-old and has been Hope’s ride for the past eight years. She has ridden Total in the USET Finals and at Spruce Meadows as well as numerous Welcome Stakes, Show Jumping Hall of Fames and Grand Prixs. Total Touch and his companion, Wall-e.
Hope has had 11-year-old Vision EH for three years. They are getting to know each other more each time out. The pair will sometimes show in the Amateur division depending on the course designer, weather and how many weeks they will be showing. “She’s my sports car and she’s always game,” smiled Hope. Caitlin Hope and Vision EH. Hope and Total Touch were one of 14 clear rounds out of a field of 43 entries in the Welcome Stake. Vision EH had a single rail in the first round. The amateur pair held their own riding against seasoned professionals such as Tracy Fenney, Lisa Goldman and Charlie Jayne. 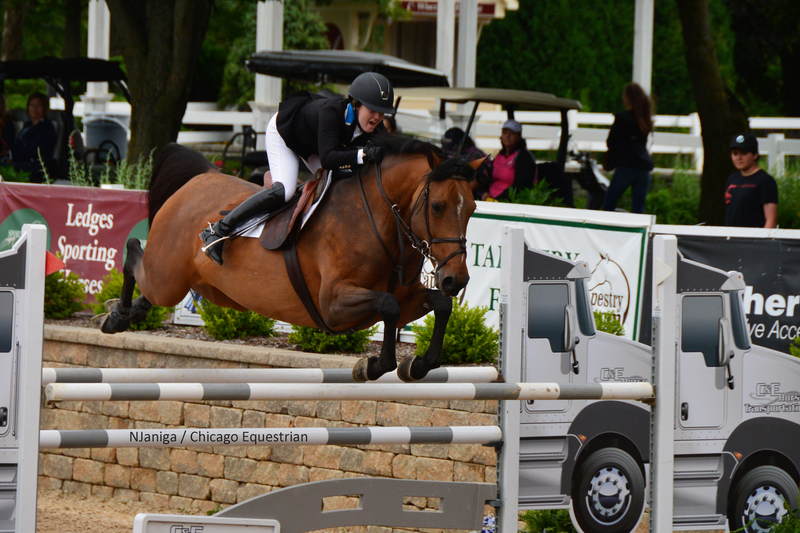 Hope will head into the $40,000 Adequan Grad Prix at Showplace Spring Spectacular on Saturday.